Enjoy the ornamental waterfalls and garden shrubs at the Hotel Don Pancho. Why settle for anything less on your holiday? The Hotel Don Pancho sets the standard for others to follow. 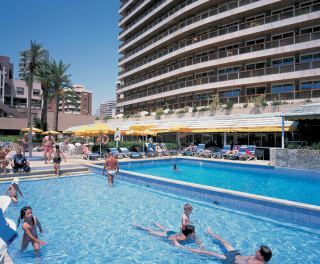 Regarded very highly by other holidaymakers and tour operators, this hotel is a 'must' for your holiday in Benidorm. There's tasteful decor throughout this comfortable and relaxing hotel. If you are looking for relaxing surroundings within easy reach of Benidorm, then you can't really go wrong booking your holiday at the Don Pancho. We stayed in the Don Pancho having been recommended by friends. This is a very comfortable hotel which is clean. Our bedrooms was comfortable with plenty of space. Towels changed daily. Breakfast was always the same not much variety, and dinner was not always well presented with little indication of the dishes, although when on the menu the roast beef was delicious. The entertainment was not very exciting, however the hotel bars gave good value. All in all a comfortable clean hotel and certainly overall proved a nice place to stay on our first visit to Benidorm and I would go back there one day. "This Was Our Last Visit To Benidorm"
Wife and I both in our fifties (but younger thinking/acting) just got back from 11 days at the Don Pancho, location is good, we asked for and got a high floor (13th) this was ok but the lifts can be a nightmare, there are four but only small, max 6 people and that's a squeeze. Found that the majority of clients were older people (50-80 yrs), no organised day time activities and the evening activities were indoor and mainly ballroom dancing that appeared to cater for the locals, especially the single men who stand at the bar eyeing up all the women! it quite amusing to watch their antics, we gave nicknames to some of them i.e. "the merecat" who kept sitting down and standing up to look for any spare women. Overall the hotel was very clean and the waiters were OK, you can charge all your drinks to your room if you want. This was our last visit to Benidorm full stop, seen it all before. "Dining Room Is Large But Is Never Crowded"
The wow factor for the Don Pancho hotel starts when you first arrive and walk through a Mayan themed garden, complete with rivers and waterfall. The check in was quick and friendly with a porter taking your luggage up to your room (unheard of in Benidorm). The rooms are fully carpeted with a TV including some English channels, fridge, silent aircon, furnished balcony, and lots of storage space. All rooms face the front of the hotel overlooking the beach. There are four lifts and although I was on the top floor the longest I had to wait was 5 minutes. The hotel in general is cleaned to a high standard and staff are efficient and friendly with first class customer service skills. The food in the hotel is also of a good quality, with a good choice of dishes. The dining room is large but is never crowded and the tables are cleared quickly so you will never have to wait for a table or for your drinks. A card key is needed for your room and also to gain enterance to the hotel after 1.am or you can call the night receptionist who is always on duty. The location of the hotel is also good with Calle Gerona with all that has to offer running along the back of the hotel, there is a bus stop oustide the hotel which will take you into the old town, or it is a 15min walk. The beach is just down the street in front of the hall about a 5min walk. This hotel gets a number of returning guests each year and having stayed here I now know why.